So I signed up and on 1 January 2011 there were 573 days until the start of the Olympics. My aim is to have done 2012 miles by then. That’s 3.5113438 miles per day average…..
Well OBVIOUSLY I needed some gadgets and tracking system so I knew how I was progressing. A quick tweet and I had quite a few suggestions for iPhone apps that could help. After a bit of checking them out I settled on starting with RunKeeper as it seemed to do the main thing I wanted (track distance using the GPS). Then I wrestled with my iTunes account for ages before I managed to download it…mainly my own fault for not being able to remember the password ddoh!! (BTW you don’t have to run it lets you tell it what activity you are doing like cycling, walking, hiking etc…computers they are so clever huh). 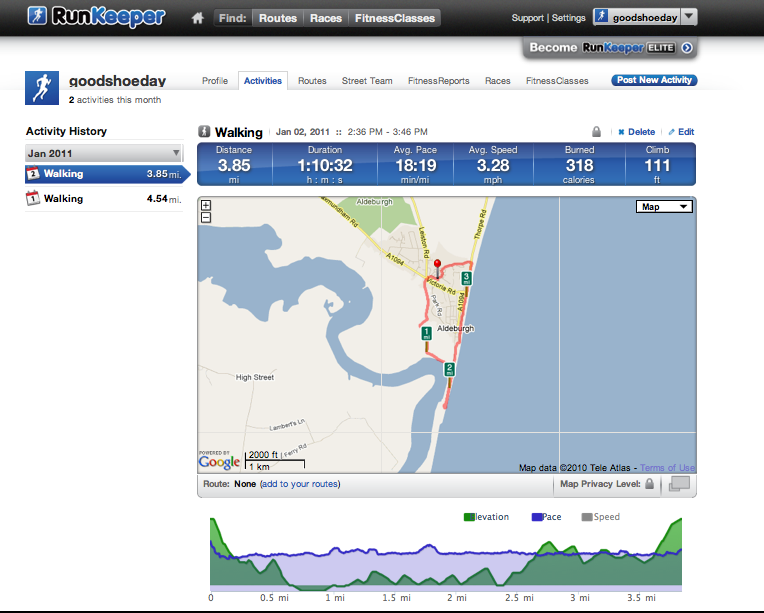 The stats load to the RunKeeper site automatically if you want them to so you can get all geeky and look at your pace by section, the rollingness of the terrain covered (max height here 39 feet above sea level) and so on….useful I think as I progress to see how hopefully I am improving. Day 2 we decided on a different but regular walk we guessed this at 2.5 miles and it came in at 3.85…so we have a theme here we are rubbish at estimating distance….wonder if we are as inaccurate at guessing really long distances. Today we were a little faster but thats probably because part of yesterday was on the shingle beach. Legs feeling the effort a little today….now I know 8 miles in 2 days isn’t really that far but it is when you only have to walk about 5 metres to your desk each day. So end of day 2 I should be at 7.02268761 miles and I’m at 8.39 miles = AHEAD , which is nice. Previous Previous post: What’s all this then….